Burt's Bees doesn't just make safe products, they also make products that WORK. I am an admitted SUPER FAN of Burt's Bees. I LOVE Burt's Bees and use several of thier prodcuts every day. The following are 100% honest and original Burt's Bees product reviews. These reviews have been provided by myself, or fellow natural skin care lovers. What It Is. 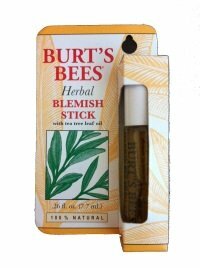 Burt's Bees Herbal Blemish Stick is a 100% natural spot treatment for blemishes. The magic is in the 10 highly effective herbal ingredients. Willowbark, nature's answer to salicylic acid, clarifies and gently exfoliates skin, helping to clear pores and prevent breakouts. This product also benefits from the antiseptic and astringent properties of tea tree oil and juniper oils. Calendula is thrown in the mix to help reduce inflammation and redness. All these ingredients work together in a highly concentrated formula that will help keep your skin blemish free naturally. Why I Love It. Quite simply, it WORKS. The Burt's Bees Herbal Blemish stick is by far my favorite of all Burt's Bees products. It is also the most effective acne spot treatment I have EVER used. This magic stick seems to get rid of any small blemishes over night. It takes a bit longer to dry up major break outs, but it does so without the redness and irritation most convetional products cause. This has been my go to blemish fighter for years now. We all want clear skin, and Burt's Bees Herbal Blemish Stick does the trick! This product is simply AMAZING! What It Is. Burt's Bees Rejuvenating Lip Balm with Acai Berry is a moisturizing and rejuvenating lip balm packed with free radical fighting antioxidants, vitamins A, C, D, and E, and Omega oils. Why I Love It. I must admit that I had a bit of buyer's remorse when I first used this product. After a few uses, however, I actually began to like it. If you are looking for a basic lip balm that goes on clear, Burt's Bees Rejuvenating Lip Balm With Acai Berry is a great choice. It goes on smooth and clear, leaving lips smooth and hydrated with a slight shine. If you prefer a lip balm that provides a hint of color, I'd recommend trying the Replenishing Pomegranate Oil Lip Balm or one of the new Burt's Bees Tinted Lip Balms. If you've tried a product not listed, I'd love to know what you thought of it! 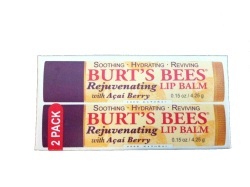 I'm always on the look out for must-have Burt's Bees products! Interested in a product that's not listed? Subscribe to my natural skin care blog to receive site updates, which include new product reviews. What's Your Favorite Burt's Bees Product? Have you discovered a Burt's Bees product you simply can't live without? We all want to know! Good natural skin care product information is hard to find! Help out other natural skin care lovers by sharing your favorite Burt's Bees products and reviews here.